When a Triple Crown winner retires to stud, the expectation is that his debut book of mares will be one of the strongest of the season. 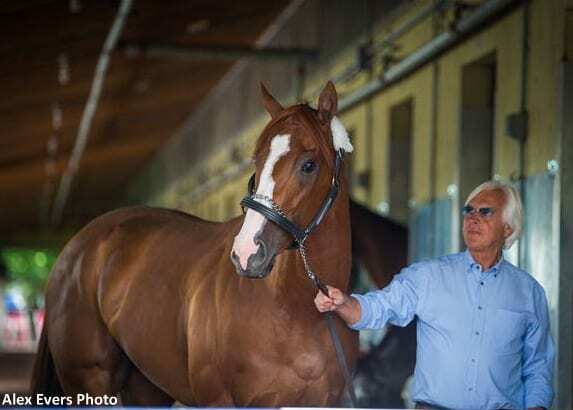 The first class of mares bred to 2018 Horse of the Year and Triple Crown winner Justify has lived up to that expectation, per an advertisement released by Coolmore Australia. Among the group are the dams of eight champions, two Belmont Stakes winners, and a Kentucky Derby winner. On their own racetrack merits, the mares in Justify's book include a Horse of the Year, 10 champions from around the world, and five Breeders' Cup winners. Justify stands the North American breeding season at Coolmore's Ashford Stud in Paris, Ky., for an advertised fee of $150,000, and he will shuttle to Coolmore's Australian base for the Southern Hemisphere season later this year. Following is a list of mares booked to Justify for his first Northern Hemisphere season at stud, as announced by Coolmore, with each mare's sires and their credentials. This entry was posted in Bloodstock, NL List and tagged Appealing Zophie, ashford stud, bar of gold, bubbler, caledonia road, champagne room, coolmore, Coolmore Australia, Emma's Encore, grace hall, groupie doll, Havre de Grace, Horse Racing, Justify, mining my own, Morena, noted and quoted, sambuca classica, Stallions, Storm Dixie, Thoroughbred breeding, Turbulent Descent, untouched talent, vale dori, zipessa by Paulick Report Staff. Bookmark the permalink.